On This Page you'll see some of the Winning Cats/Kittens Owhl has had thru the years. Some of these lovely babies were shown by other people to their wins, but I remain just as proud of them as the ones I showed myself, if not more so. You'll see cats that have won in Kitten, Championship, Premiership/Alter class as well as Straight Folds that won as Household Pets (HHP - sadly the only way to show a straight in CFA/TICA. In other countries/organizations these lovely babies can be shown "regularly"). 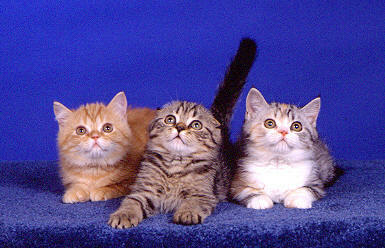 Most are Scottish Folds, but there are also British, Cornish Rex & even a few Persians. I have shown both CFA/TICA so winners from Both organizations are pictured. One of the highest awards a Breeder can achieve is that of DM (Distinguished Merit) or OD/OS (outstanding Dam/Sire). This award is given to cats that have proven themselves as breeding cats by producing a particular # of Top Winning cats. (5 winners for Female - both organizations, 10 Winners for Male (tica) 15 (CFA) ) Below is a female of mine who achieved this Title and her offspring that helped. All were shown/won in CFA except for Rosey who was only shown TICA... but was too lovely not to include.